When I grew up in northern Ontario, my parents operated a tourist camp called Amogla camp. 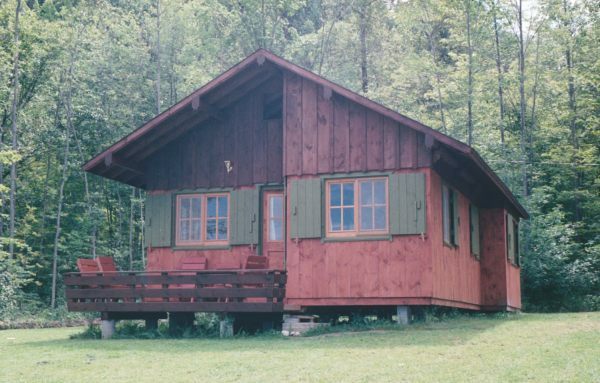 When my parents bought the camp in 1980, it had eight "old school" style cottages without indoor plumbing, and each with its own outhouse. Over the course of the next decade, we tore down all the old cottages and replaced them with much nicer newer ones with indoor plumbing. 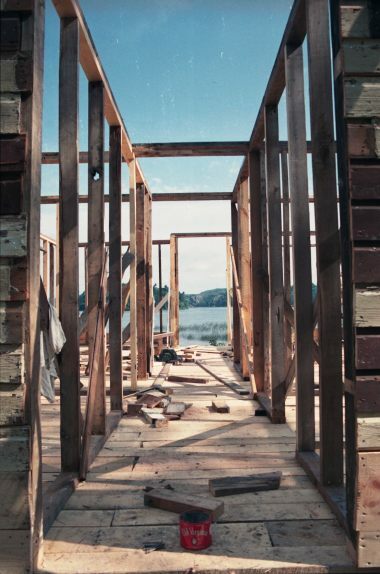 In 1988, my last year before heading off to university, I finally had my own camera and took photos of various stages of the construction. I also kept a log of what we did every day, so based on the pictures and the log, I'll give you a chronicle of how we built one of the cottages. On the day before we got started, I went into town to rent a weed whacker with a saw blade on the end of it. I used it to re-clear the building site. We had cleared the brush from the site a year earlier, but the brush had already grown chest high in the twelve months since then. The saw blade weed whacker worked amazingly well and was fun to use. The rental only came to $10 when I returned it because I only used it for half a day. I guess things were cheaper back in 1988. We started the day by surveying the site with a tape measure. The lines of the cottage's outline were marked on horizontal rails nailed onto the posts just past where the corners of the cottage would be. A long wire with a brick on either end could then be hung over the rails so that it stretched along what would be the edge of the cottage. The wires with bricks on them could be moved out of the way to then work on the foundations. We dug the foundation holes by hand. We hit fairly hard clay in every hole. I argued with my dad that the holes should be deeper. He said, if you want them deeper, dig them deeper on your own. I proceeded to do that, but my dad stopped me soon after. It would take too much cement, and cement is expensive! Those foundations would later give us lots of problems. But digging them deeper probably wouldn't have helped all that much. I drove to town and got six bags of Portland cements, four bags of masonry cement, and fifty cinder blocks. 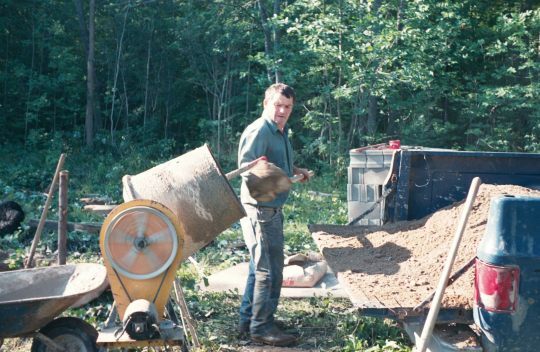 I also got the cement mixer from our other place (the "farm") and set it up. Then drove to the gravel pit on our property and shoveled a heap of gravel onto the back of the pickup truck. We mixed the cement for the foundations in a small cement mixer. We put three to four cement mixers loads into each hole. We'd dump empty the cement mixer into the wheelbarrow, and then dump the cement in the hole. The shape of the hand-dug holes served as the cement forms. We used about one shovel of cement for every fourteen shovels of gravel for our cement mix. Ordering a cement truck was something that had never occurred to us. But living in northern Ontario, the cement truck would have had to come from a fair distance away as well. The above ground part of the foundation was mostly made by stacking cinder blocks, with mortar in between. We used some beach sand as aggregate for the mortar. 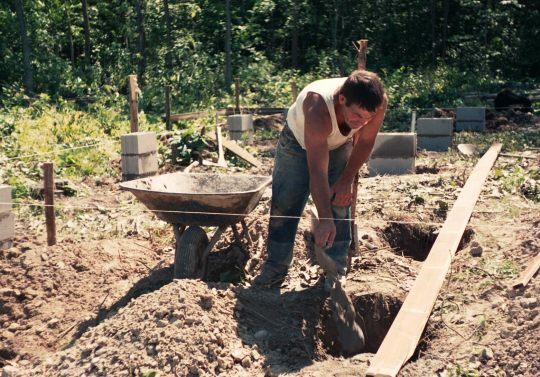 In this photo, I think my dad is adding a bit of mortar to the hole before placing the first cinder blocks in the hole. You can see the wires strung that demark the edges and approximate level of the cottage. With the wires in place, it's relatively easy to ensure that the foundation comes up to the right spot. 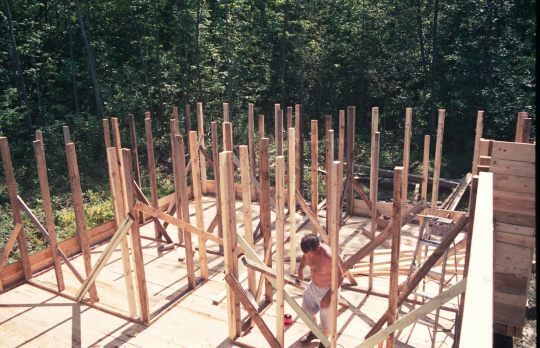 With the foundation columns reasonably firm, we started placing the beams to form the substructure of the cottage. 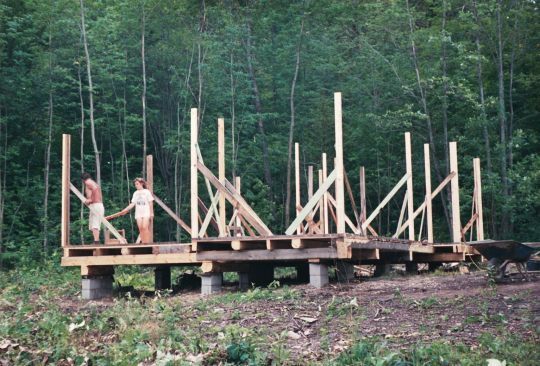 The first beams to go down were about 20x20 cm (8x8 inches). On top of these, we put the floor joists. We substituted beams for floor joists where load bearing walls would be. We used these really big nails to attach the beams to each other. A short axe was just the right weight instrument to drive those in. 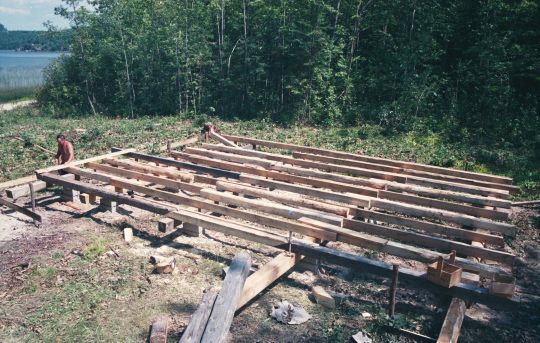 With the beams and joists in place, my dad and I drove to the "farm" - our other property where the workshop was, and ran a lot of boards from our own sawmill through the thickness planer in my dad's workshop. These would become the boards for the subfloor. My job was always to pull the boards out of the planer. Not a fun job, seeing that there was no dust extraction system. Occasionally, a loose knot from one of the boards would also get shot out of the planer. I rigged a chute and blower to where the shavings came out of the planer to at least deflect the shavings sideways. This at least got the shavings out of my way, but it didn't do much about the dust. Nailing down the subfloor. 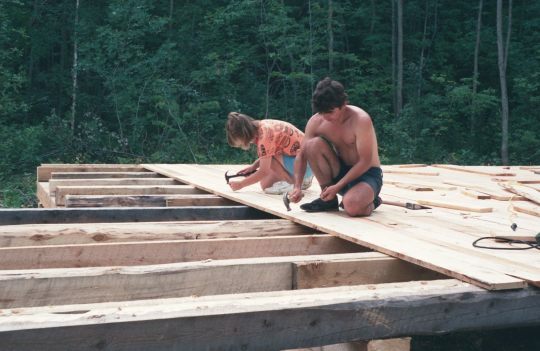 My dad cut the boards to length and laid them down, while my sister Marlene and I nailed them down. No air nailer. And many of the nails we used were also recycled nails form dismantling some of the old cottages. It didn't take all day to do the whole floor. 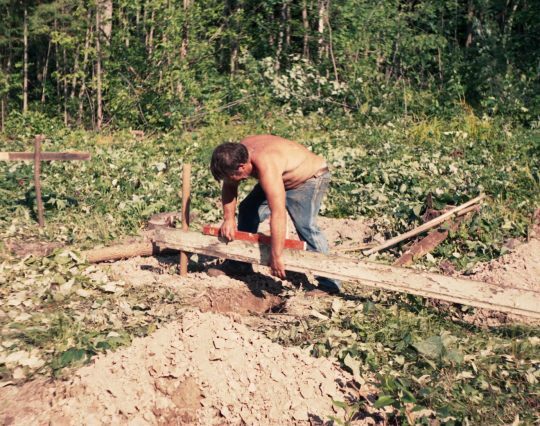 After the floor was nailed down, my dad headed to the "farm" to his workshop to prepare more lumber. My sister Marlene and I cleaned up all the bits of scrap wood that accumulated around the building site and then got the rest of the day off. August 13th was a Saturday, which meant that the previous week's renters left and the next week's renters arrived. That always meant lots of chores around the camp. My sisters would help my mom with cleaning the cottages, while I was responsible for cutting the grass, cleaning out the boats, and replenishing the firewood stash in any cottages that needed more, and fixing whatever broke. By the afternoon, my dad was back with more materials and started to frame the walls. He needed an assistant to help set the vertical pieces in place and fetched my sister, who, after finishing her chores was already in the lake and thought she'd have the afternoon off. She was not enthused. I spent the afternoon replacing the starter pinion in the riding mower and renting out a few outboard motors to camp customers. Next I took the garbage to the dump. There was no municipal garbage truck at the time, and it seemed the American camp customers always produced a lot of garbage - paper plates and food packaging. 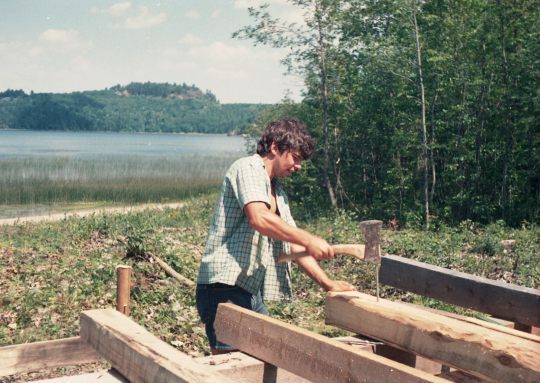 My dad also sent me to the farm to take measurements of all the windows that he'd built for the cottage earlier in the summer. The next Monday, we finished framing the walls. I cut some 2x4 rafters from an old cottage into 8-foot lengths to use as more studs. The rest of the studs were material my dad had cut to size the previous Friday. The standard stud size is 1.5" x 3.5" (3.8 x 8.9 cm), but our studs were all 1.75" x 3.75", which was the standard size before the 1970s. With all the lumber coming from old cottages or my dad's sawmill, it made more sense to use the old dimensions. None of the studs were bought. 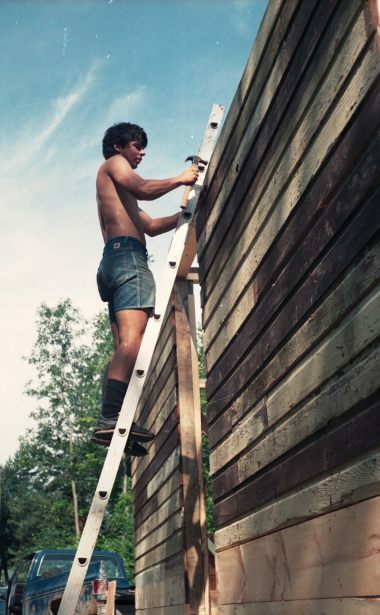 I also started nailing some boards to the outside walls that day. We finished nailing boards to the outside walls. The boards were mostly recycled boards from one of the old cottages that we tore down a year earlier. The boards on the outside walls would later get covered with another layer of boards, oriented vertically. These boards were there to provide a little bit of extra rigidity and insulation. The way those boards were shaped, and with the old paint on them, they weren't useful for anything else, so this was a good way to make use of them.